What herbs do you use for your protection spell? We have decided to compile a small list of herbs that we keep in our cupboards and share them with you all. Now there may be a few missing from the list, that's where you can chime in. If you notice any missing herbs you would like to see on the list, let us know! 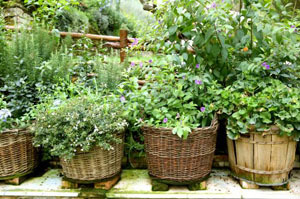 The herbs commonly used for protection are those that contain powers to dispel evil and create a protective barrier when burned, carried on your person, or hung wherever protection is needed. The following herbs contain a positive energy that are able to repel any negative vibrations or energy you are receiving from another person, place or object. Disclaimer: These should never be eaten or drunk without talking to a qualified herbalist first. Please check with an herbalist or a doctor before you make any brews or ingest these herbs. Always check before you use any herb because some herbs can stop conventional medicines working. Herbs can heal and help with spell work, but herbs can also kill. BE CAREFUL AND ALWAYS CHECK FIRST! Used: This is often used to protect your home as well as your marriage. Used: This is used to draw in good luck to your home, while it protects you from any potential evil that may be present. Used: Mugwort can be used in protective sachets, especially those created in relation to travel. It is said to prevent delays, and other annoyances associated with traveling, as well as to protect the traveler from accidents, thieves and other dangers associated with traveling. Used: Often you will find that sage is used while doing smudging rituals, its magickal attribute is its smoke. This herb will cleanse your home of any negativity and lingering evil spirits. The vervain plant may be bruised and worn about the neck for protection from both headaches and snakebites. You can also create a charm which is also said to bring help to you when you need it, no matter how dire your situation. Carry a fresh spring on your person to help protect you from any baneful magick spells cast against you. As mentioned above, these are some of the herbs our witches at the Coven have stored away for different uses in their Spells, this is by no means a complete list. We would love to know which Spells you use during your Castings. We love getting your input so you can either leave a comment here, or join the conversation on our Facebook page. We look forward to all the new ideas we expect are coming! Dandelion root is a good for sleep protection, i put a piece under my pillow. I'm really interested in your products,also I would like to receive my daily horoscope,and be put on your mailing list.